In this pAsuram, mAmunigaL is following AzhwAr’s pAsurams of instructing emperumAn‘s mOksha pradhathvam (granting of liberation) and is mercifully explaining it. How is that done? AzhwAr sees that not only ISvaran is accepting AzhwAr along with his relatives, he is also eager to bless them the bliss which matches that of the mukthas (liberated souls); AzhwAr sees this and instructs emperumAn‘s mOksha pradhathvam to samsAris (worldly people) to have them all become related to him and everyone accepted and agreed to his views; but as they ignore those instructions. AzhwAr starts talking about the benefit he acquired and feels satisfied in thiruvAimozhi 2.8; mAmunigaL mercifully explains this starting with “aNaindhavargaL thammudanE“. em mA vIdu – the abode of ultimate liberation. AzhwAr mercifully gave faultless instruction highlighting emperumAn‘s quality of mOksha pradhathvam only to unite the nithya samsAris with nithyasUris who approach and serve sarvESvaran, to make them become a recipient of krishNa’s mercy; such AzhwAr’s divine, lotus feet which are having well spread out glories, are the abode of ultimate liberation. aNaindhavargaL thammudanE – AzhwAr is saying “to unite [the samsAris] with nithyasUris such as anantha (AdhiSEsha) et al who approach and serve sarvESvaran who is the lord of SrI dhEvi, bhU dhEvi and nILA dhEvi, being seated on ananthabhOga paryanka (AdhiSEsha, serpent bed) as said in ‘aNaivadhu aravaNai mEl’ (emperumAn reclines on AdhiSEsha bed)[1st pAsuram]; alternatively – AzhwAr is saying “to unite with the confidential devotees of emperumAn as said in thiruvAimozhi 2.7.1 ‘kEsavan thamar‘ (devotees of kESava)”. thammudanE indicates “with AzhwAr himself”. It can also be read as “thammudanE aNaindhavargaL” implying those who became close to AzhwAr to be considered by him as “emar” (my people). Ayan arutku ALAm guNam thanaiyE koNdu – To be the target of the mercy of krishNa who incarnated to be easily approachable by his devotees as said in “epporutkum – iNaivanAm” (being born in all species). 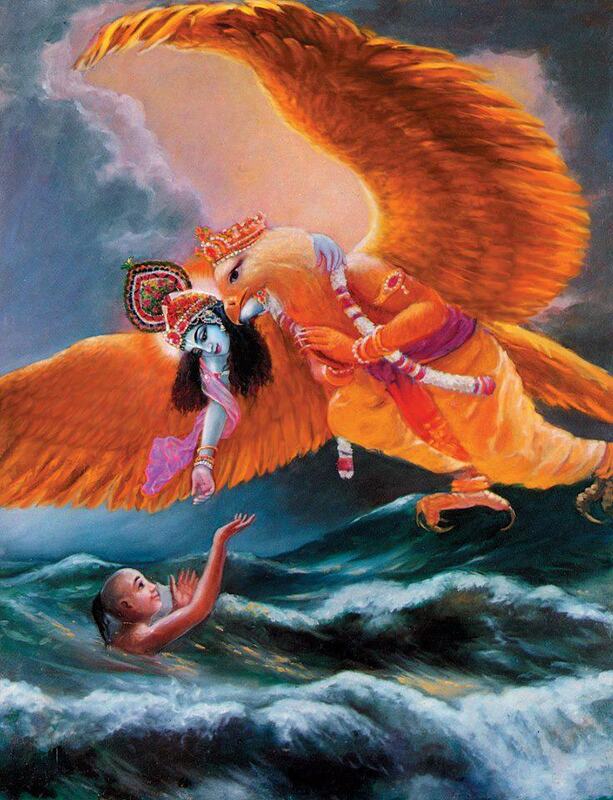 Further, AzhwAr said “en kaNNanai – nAn kaNdEnE” (I saw my krishNa) [10th pAsuram]. Using only the quality of mOksha pradhathvam of such emperumAn. Alternatively, when it is recited as guNangaLaiyE koNdu, it implies, using his qualities such as mOksha pradhathvam etc as the tool to reform the worldly people without any expectation from anyone else, as shown in “vIdu mudhalAm” (cause for mOksham) [1st pAsuram]. Only in this incarnation of krishNa, emperumAn gave liberation to idaichchi (cowherd woman), idaiyan (cowherd man), thayirth thAzhi (pot containing curd), kUni (the hunch back), mAlAkArar (flower vendor), piNavirundhu ittavar (gaNtAkarNa who offered a dead body to krishNa), vENdadisil ittavar (the wives of rishis who offered food to krishNa). As said in “iNaivanAm epporutkum vIdu mudhalAm” (incarnate in all species to grant liberation), though he grants liberation in many incarnations to vEdan (hunter – guha), vEdachchi (hunter woman – Sabari), pakshi (bird – jatAyu), kurangu (monkey – sugrIva and the monkey army), charAcharam (mobile and stationary – all entities of ayOdhyA), since it is mentioned as “Ayan arutku” (for the cowherd, krishNa’s mercy), it is explained in the context of krishNAvathAram. perumAL (SrI rAma) mercifully liberated periya udaiyAr (jatAyu) saying in SrI rAmAyaNam AraNya kANdam 68.80 “gachcha lOkAn anuththamAn” (you shall reach the supreme abode). In this manner, reforming [the samsAris] during his incarnations with his qualities such as mOksha pradhathvam. ulagaik kUtta iNangi miga – Fitting well to unite nithya samsAris with nithyasUris. Unable to bear their pitiable state, incarnating in the same species as they are, like trapping of animals. Should be recited as “Ayan arutku ALAm guNangaLaiyE koNdulagai – aNaindhavargaL thammudanE kUtta – miga iNangi” to get the proper meaning. miga – iNangi mAsil upadhEsam sey – AzhwAr who has pure knowledge, continuously gives pure instructions which is devoid of any defect such as expectation of fame, praise, wealth etc. AzhwAr mercifully instructed in “iNaivanAm epporutkum vIdu mudhalAm” (he will be the cause of mOksham through his incarnations) [1st pAsuram], “piRavik kadal nIndhuvArkkup puNaivan” (he will be the boat for those who desire to cross over the [ocean of] birth in material realm) [1st pAsuram], “pulan aindhu mEyum poRi aindhu nIngi nalam andham illadhOr nAdu puguvIr! palam undhu sIril padimin OvAdhE” (Oh the ones who desire to be detached from the five sense organs which trap him (AthmA) completely in the five matters and to enter the abode of unlimited bliss! You always be immersed in the auspicious qualities of such emperumAn which can be explained as the result) [4th pAsuram]. mAsil upadhEsam sey mARan malar adiyE – Such AzhwAr‘s flower like divine feet only. vIsu pugazh em mA vIdu – The distinguished liberation which has well known greatness as said in thaiththirIya upanishath Anandhavalli “paramEvyOman” (supreme sky). For AzhwAr, emperumAn’s divine feet as said in thiruvAimozhi 2.9.1 “semmA pAdham” (great, reddish feet) are the ultimate liberation and for mAmunigaL, such AzhwAr’s flower like feet are the ultimate liberation. It is said in AzhwAr‘s thaniyan “vibhUthis sarvam … SrImath thadhangri yugaLam praNamAmi mUrdhnA” (everything is nammAzhwAr’s divine feet for us, and we hold his divine lotus feet on our head). This entry was posted in Other, thiruvAimozhi nURRandhAdhi on December 15, 2018 by Sarathy Thothathri. In this pAsuram, mAmunigaL is following AzhwAr’s pAsurams of blissfully speaking of those who are his ancestors and descendants and who acquired servitude towards bhagavAn, due to relationship with AzhwAr himself and is mercifully explaining it. How is that done? AzhwAr sees that emperumAn’s desire with AzhwAr does not stop there but extends to all his relatives and their relatives; not just their hurdles are removed as said in thiruvAimozhi 2.6.7 “emar kIzh mEl ezhu piRappum vidiyA ven naragaththu enRum sErdhal mARinarE” (my relatives of twenty one generations will ever avoid reaching this hot hell named samsAram (material realm) where there is no relief), but also are flooded with the benefit [of being able to do kainkaram to emperumAn]; AzhwAr becomes blissful thinking how affectionate he is as said in SrI rAmAyaNam yudhdha kANdam 114.101 “mamApyEshadhA thava“, starts talking about his qualities and activities through his thirudhvAdhaSa nAma (twelve divine names) which is the cause for accepting AzhwAr along with his relatives in thiruvAimozhi 2.7 “kEsavan thamar“; mAmunigaL mercifully explains this starting with “kEsavanAl en thamargaL“. Oh heart! AzhwAr mercifully explained clearly saying “Those who belong to me acquired radiance, along with those who are related to them, both in previous generations and subsequent generations”; he is having glories which are spreading everywhere; surrender unto the divine lotus feet of such AzhwAr, considering them as the means for liberation for all eternal AthmAs. kEsavanAl en thamargaL kIzh mEl ezhu piRappum thEsadaindhAr enRu siRandhuraiththa – This is in line with “empirAn emmAn nArAyaNanAlE – emar kIzh mEl ezhu piRappum – kEsavan thamar AnArgaL – mAsadhir idhu peRRu aththAlE nammudai vAzhvu vAykkinRavA” (SrIman nArAyaNan who is having lordship and who is showing his blue-emerald like form and making me exist fully for him with his reddish beautiful divine eyes, acknowledged by the nithyasUris too, is giving his experience; by such emperumAn, due to being my lord, those devotees of kESava, who are my seven generations of ancestors and descendants acquired this great glory which is our wealth of SrIvaishNavam and are flourishing.) [1st pAsuram]. kEsavanAl en thamargaL – My people acquired radiance by emperumAn who is the cause of the universe [as in being the lord of brahmA, rudhra et al], who destroys the enemies [as in killing kESi, the horse] and who is having beautiful hair. Being the servitor of kESava is the radiance for them. For an AthmA, servitude is the real radiance; considering that his relatives, both ancestors and descendants, acquired such radiance due to their connection with him, due to the gratitude, AzhwAr mercifully and clearly recited the twelve divine names of emperumAn viz kEsavan [1st pAsuram], nAraNan [2nd pAsuram], mAdhavan [3rd pAsuram], gOvindhan [4th pAsuram], vittu [5th pAsuram], madhusUdhan [6th pAsuram], thirivikraman [7th pAsuram], vAmanan [8th pAsuram], sirIdharan [9th pAsuram], irudIkEsan [10th pAsuram], paRpanAban [11th pAsuram] and dhAmOdharan [12th pAsuram] and became blissful. siRappu – gratitude. malar adiyE man uyirkku ellAm uygaikku ARu enRu – The [lotus] flower like divine feet which are the apt means for all AthmAs which are eternal, to be uplifted. nenjE aNai – Oh noble heart which is a tool for me who is one amongst them [those relatives of relatives of AzhwAr]! You too surrender unto the flower like divine feet. emperumAn‘s acceptance being the absolute means is explained by AzhwAr in “nArAyaNanAlE“, and it is highlighted through “kEsavanAl” and is further explained in “mAdhavan enRadhE koNdu” (just for uttering the name “mAdhava“) [3rd pAsuram], “emar kIzh mEl ezhu piRappum mEvum thanmaiyam AkkinAn” (reformed my relatives in seven births of ancestors and descendants and made them desire for him) [4th pAsuram], “ennaik koNdu” (accepting me) [4th pAsuram]; further, to establish that such acceptance was for his own benefit, AzhwAr mercifully explained it in “vittilangu senjOdhi” (shining reddish radiance) [5th pAsuram], “ammAn thirivikramanai – ennakE aruL seyya – enakkenna – vidhi sUzhndhadhu” (my supreme lord thrivikrama, having blessed me, I am wrapped with his mercy) [6th pAsuram], “thozhum manamE thandhAy” (you blessed me with a mind which worships you) [7th pAsuram], “ennaith thImanam keduththAy” (you reformed my evil mind to be a noble one) [8th pAsuram], “unnai ennuL vaiththanai en irudIkEsanE” (Oh hrushIkESa! You placed yourself in me) [9th pAsuram], “eRparan ennai Akkik koNdu enakkE thannaith thandha kaRpagam” (my supreme lord who created me, acknowledged me and exclusively gave himself to me like a kalpaka tree) [11th pAsuram] and “dhAmOdharanai” (dhAmOdhara) [12th pAsuram]. This entry was posted in Other, thiruvAimozhi nURRandhAdhi on December 13, 2018 by Sarathy Thothathri. In this pAsuram, mAmunigaL is following AzhwAr’s pAsurams of pacifying ISvaran as ISvaran unnecessarily doubted “What if AzhwAr who enjoys me saying in thiruvAimozhi 2.5.4 ‘appozhudhaikkappozhudhu en ArAvamudham‘ (my unquenchable nectar, every moment), leaves me claiming himself to be unqualified” and is mercifully explaining it. How is that done? As AzhwAr, who united joyfully with sarvESvaran, said in thiruvAimozhi 2.5.5 “allAvi uL kalandha” (emperumAn united with the lowly self) and highlighted his lowliness. emperumAn unnecessarily doubted “What if he thinks to leave me as he did in thiruvAimozhi 1.5 ‘vaLavEzh ulagu‘?” and became perplexed; seeing that, AzhwAr became blissful thinking “How much subservience and motherly care he has towards me!” explaining the many reasons why he would not leave emperumAn and eliminating his doubt. Thus he sustains him in thiruvAimozhi 2.6 “vaikundhA maNivaNNan“; mAmunigaL mercifully explains this starting with “vaigundhan vandhu“. AzhwAr sustained himself after sarvESvaran who owns nithya vibhUthi, arrived and united, but started performing naichyAnushandhAnam; looking at that emperumAn became worried and started breaking down; seeing that, as AzhwAr mercifully said to him “I will not leave you”, emperumAn became calm. vaigundhan vandhu kalandhadhan pin – After sarvESvaran, who owns nithya vibhUthi, united with AzhwAr seamlessly as said in thiruvAimozhi 2.5.1 “andhAmaththanbu seydhu en Avi sEr ammAn” (after emperumAn entering my heart with the same desire he has on paramapadham). vAzh mARan – AzhwAr who was enlivened by that union. naiginRa thanmai thanaik kaNdu – AzhwAr seeing how emperumAn is breaking down. unnaith thAn vidEn enRuraikka – Saying “I will not leave you who are fearful of separating from me” as mercifully said towards ISvaran in “unnai nAn pidiththEn koL sikkanavE” (realize that I am firmly holding on to you) [1st pAsuram], “unnai enganam vidugEn” (How can I leave you?) [4th pAsuram], “andhamil adimai adaindhEn viduvEnO” (after acquiring boundless joyful servitude towards you, there is no reason to leave you) [5th pAsuram], “unnai nAn adaindhEn viduvEnO” (after you who are of such qualities having united with me, how will I leave you?) [10th pAsuram]. 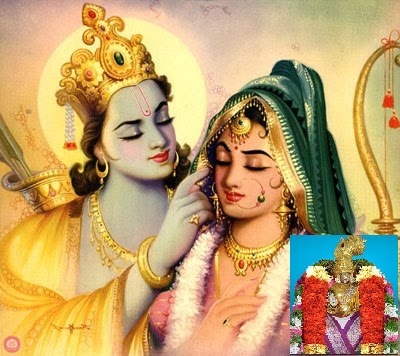 vanmai adaindhAn kEsavan – As said in samkshEpa rAmAyaNam 85 “… vijvara: pramumOdha ha …” (having his fever removed, SrI rAma is happy), and as said in “thuLakkaRRamudhamAy engum pakka nOkkaRiyAdhE” (emperumAn, who is without any fear, and is like nectar, cannot see anywhere else now other than me) [2nd pAsuram] and “en maradhaga malaiyE” (one who makes his emerald mountain like form available to me) [4th pAsuram], kEsavan emperumAn who has beautiful hair, attained calmness. This entry was posted in Other, thiruvAimozhi nURRandhAdhi on December 12, 2018 by Sarathy Thothathri. In this pAsuram, mAmunigaL is following AzhwAr’s pAsurams of how emperumAn arrived along with his devotees [nithyasUris in the form of weapons and ornaments] and eliminated his grief which was highlighted in thiruvAimozhi 2.4 “Adi Adi“, and is mercifully explaining it. How is that done? emperumAn who is known as thiruvAimozhi 2.4.11 “vAttamil pugazh vAmanan” (vAmanan emperumAn who has no worries and has many auspicious qualities) arrived and mercifully united with AzhwAr, eliminated AzhwAr’s sorrow which was experienced in “Adi Adi” by arriving with his devotees, just as he arrived suddenly and eliminated the sorrow of elephant which was tormented by the crocodile for thousand years; AzhwAr seeing the newly acquired glow in emperumAn‘s form after having united with AzhwAr, enjoyed it and spoke joyfully about it in thiruvAimozhi 2.5 “andhAmaththanbu“; mAmunigaL mercifully explains this starting with “andhAmaththanbAl“. AzhwAr had his sorrow eliminated due to sarvESvaran arriving with the desire he has for SrIvaikuNtam, along with the nithyasUris in the form of weapons and ornaments, and magnanimously uniting well with AzhwAr. Oh heart! Always have befitting bhakthi on such AzhwAr’s divine feet. 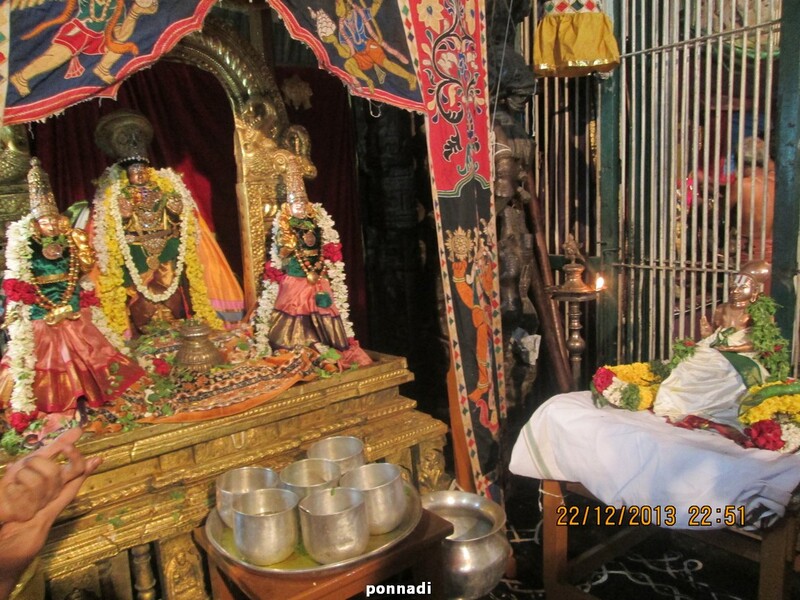 andhAmaththu anbAl – With the desire he has for SrIvaikuNtam. With the great affection for that abode and the dhESikas (leaders) there. adiyArgaLOdu iRaivan – devotees are there, nithyasUris, in the form of weapons and ornaments; sarvESvaran who are with them, united with AzhwAr. 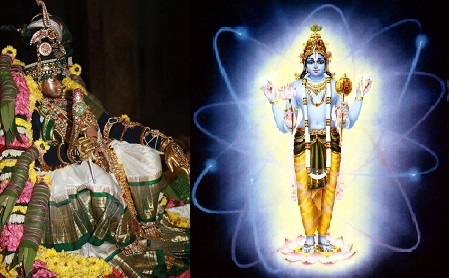 mAmunigaL is thinking about “andhAmaththanbu seydhu en Avi sEr ammAnukku andhAma vAzh mudi sangu Azhi nUl Aram uLa” (bhagavAn who is the natural master and has attachment towards paramapadham, became well-placed in my heart; manifesting his supremacy, radiant crown having beautiful garland, divine weapons, sacred thread and garland appeared clearly) [1st pAsuram]. vandhArath thAn kalandha vaNmaiyinAl – sarvESvaran, due to the magnanimity of arriving at the location of AzhwAr who is as said in vishNu dharmam “paramApadham Apanna:” (one who was caught in great danger) and united fully with him. sandhAbam thIrndha – As said in SrI rAmAyaNam yudhdha kANdam 131.15 “viSOdhithajata: snAthaSchithramAlyAnulEpana: | mahArhavasanO rAmasthasthau thathra SriyA jvalan ||” (having washed his hair, having mercifully bathed, wearing many different flower garlands, sandalwood paste, expensive clothes, SrI rAma shone radiantly along with the wealth of beauty in that throne – in this SlOkam, it is explained that SrI rAma acquired new radiance after accepting bharatha) and in SrI rAmAyaNam bAla kANdam 77.29 “athIva rAmaS SuSubE” (SrI rAma shone greatly). As said by AzhwAr himself in “sendhAmaraith thadangaN sengani vAy sengamalam sendhAmarai adikkaL sempon thiru udambE” (his eyes look like a pond of reddish lotus flowers; his reddish ripened fruit like mouth/lips resemble a lotus flower; his divine feet look like a lotus flower; his divine body shines like reddish gold) [1st pAsuram], “thiru udambu vAn sudar … ennuL kalandhAnukkE” (The laudable form of emperumAn who is the lord of my clan, without leaving anything, came inside me and united with me, has sun-like complexion; his divine hands and eyes are reddish and fresh like lotus flower; his divine chest is the abode of SrI mahAlakshmi; his naval is the abode of brahmA; his other part is rudhra himself; how amazing is this!) 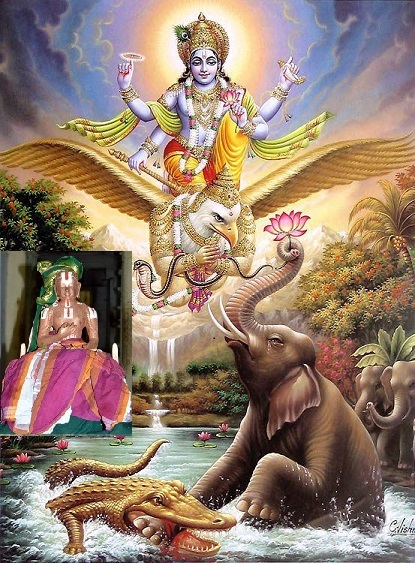 [2nd pAsuram], “ennuL kalandhavan senganivAy sengamalam minnum sudar malaikkuk kaN pAdham kai kamalam” (emperumAn, who united inside me, who is shining radiantly like a mountain, has beautiful exalted bodily features (as previously explained – reddish fruit like mouth, lotus like eyes, feet and hand) [3rd pAsuram], “epporuLum thAnAya maradhagak kunRam okkum” (he was satisfied by being the in-dwelling soul of every entity and became like an emerald mountain) [4th pAsuram], he enjoyed emperumAn growing to be huge as said in “vAttamil pugazh vAmanan” with beautiful limbs etc and became relieved from all the sorrows without any trace. sandhAbam refers to what is highlighted in the “Adi Adi” padhigam such as vAdudhal (withering), irakkam (suffering), vevvuyirthal (breathing heavily), vAy veruvudhal (speaking incoherently), uLLamuga urugudhal (heart melting), uLLuL Avi ularudhal (the soul becoming dry), thana nenjam vEdhal (heart burning) etc. To remedy the withering of the soul, AzhwAr mercifully said “allAvi uL kalandha” (one who united with this lowly self) [5th pAsuram], “en mudivu kANAdhE ennuL kalandhAn” (he united with me without seeing my lowly nature) [8th pAsuram] and “ennuL kalandhavan” (one who united with me) [2nd pAsuram] in previous decad. sandhAbam thIrndha satakOpan thiruvadikkE nenjamE vAyndha anbai nALthORum vai – On the divine feet of AzhwAr who is loved by emperumAn, who is the exclusive leader of nithyasUris, just as he loves the nithyasUris; oh heart! Fully place yourself on such divine feet as said in kaNNinuN chiRuth thAmbu 10 “un than moy kazhaRkanbai – muyalginREn” (I am trying to have desire for your divine feet). Just as one would place the treasure beneath the ground, you place your love at the divine feet of AzhwAr. This entry was posted in Other, thiruvAimozhi nURRandhAdhi on December 11, 2018 by Sarathy Thothathri. In this pAsuram, mAmunigaL is following AzhwAr’s pAsurams of speaking in the mood of a mother of a girl who was suffering in separation from emperumAn and his devotees, and is mercifully explaining it. How is that done? Not only AzhwAr was separated from emperumAn, but also from nithyasUris who are emperumAn’s life, and became unconscious to be unaware of what is happening to him. Those who care for AzhwAr pray to emperumAn for him; this is explained by AzhwAr in the mood of a divine mother whose daughter became bewildered after being separated from emperumAn subsequent to a union, where the mother informs emperumAn her emotions and actions in separation, in thiruvAimozhi 2.4 “Adi Adi“; mAmunigaL mercifully explains this starting with “Adi magizh“. AzhwAr, being upset in not enjoying the union with the group of devotees residing in paramapadham and dancing in joy with them, became very grieved; he became perplexed and suffered to be analysed and explained by madhurakavi AzhwAr et al who were greatly affectionate towards him; alas! 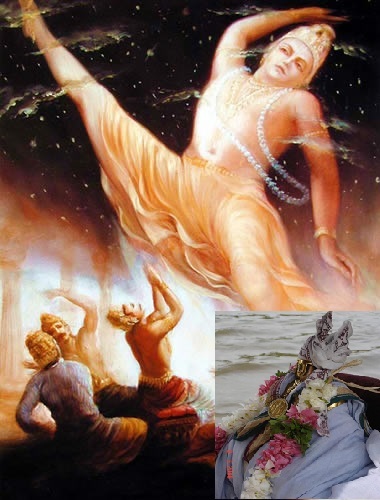 Adi magizh vAnil adiyAr kuzhAngaLudan kUdi inbam eydhAk kuRai adhanAl – [First] Adi magizh vAnil – being immersed in bhagavath vishayam and becoming blissful; alternatively – due to enjoying bhagavAn, dancing as said in SrI rAmAyaNam sundhara kANdam 61.14 “nruthyanthi kEchith” (some monkeys were dancing), and becoming blissful due to that. In such [spiritual] sky, there are devotees i.e., nithyasUris, who are the residents of SrIvaikuNtam; due to not having joined in their assembly and acquiring bliss, and hence feeling incomplete, AzhwAr who is suffering as said in “vAdi vAdum” (very exhausted) [1st pAsuram]. anbuRRAr than nilaimai Ayndhu uraikka – Well wishers such as madhurakavi AzhwAr et al, who are well aware and have great affection towards AzhwAr as said in kaNNinuN chiRuth thAmbu 10 “muyalginREn unRan moy kazhaRkanbaiyE” (trying to develop affection only to your divine feet), informed AzhwAr‘s bewilderment to emperumAn, and praying through them “this is possible by the mercy of your highness”. This is done in the mood of a caring mother of the girl, analysing and speaking about her nature. mOgiththuth thunbuRRAn mARan andhO – AzhwAr who reached the state, where he is too bewildered to speak about his own state, alas. As said in SrI rAmAyaNam sundhara kANdam 16. 28 “mayApi vyathitham mana:” (my mind is gloomy) and thiruchchandha viruththam 52 “aRRa paRRar” (those devotees who are totally detached), his attachment is to be pitied . anbuRRAr than nilaimai Ayndhuraikka – As said in SrI rAmAyaNam Sundhar kANdam 31.19 “sAthiryak Urdhvancha” (sIthA pirAtti looked at her sides and at the top), AzhwAr mercifully spoke in “engum nAdi nAdi narasingA enRu vAdi vAdum” (she is looking for emperumAn calling out as narasimha!) [pAsuram 1], “ummaik kANum AsaiyuL naiginRAL, ummaik kANa nIr irakkam ileeRE” (This girl with shining forehead and abundance of humility is becoming weak due to desire to see you (who is a treat to eyes); Oh the one who cut off the thousand shoulders of the prideful bANAsura! you have no mercy to show your form) [2nd pAsuram], “vaNdu thivaLum thaNNanthuzhAy kodIrenna thavaLa vaNNar thagavugaLE” (you, who are pure natured (towards your devotees), are not giving your divinely shining thuLasi which has shining bees) [5th pAsuram] and “ummaith thanjam enRu ivaL pattanavE” (she is going through much suffering for considering you as refuge ) [8th pAsuram), “numadhu ittam en kol ivvEzhaikkE” (what are your thoughts for this poor girl who is desirous?) [9th pAsuam] and “ivaL mAzhai nOkkonRum vAttEnminE” (you at least ensure that parAnguSa nAyaki‘s eyes which look like those of a tender deer, are protected) [10th pAsuram]. In this manner, his state was incomprehensible for himself and made everyone who sees her, to take pity upon her. This entry was posted in Other, thiruvAimozhi nURRandhAdhi on December 10, 2018 by Sarathy Thothathri. In this pAsuram, mAmunigaL is following AzhwAr’s pAsurams of seeking companions to enjoy along when emperumAn united with AzhwAr to make them be seen as “Ekathathvam” (single entity) and is mercifully explaining it. How is that done? After completing the incidental instructions to others, AzhwAr sets out to speak about how emperumAn united with him to eliminate his suffering; AzhwAr meditates upon emperumAn’s union which gives the ultimate pleasure, as said in SrI rAmAyaNam bAla kANdam 77.26 “rAmasthu sIthayA sArdham…” (The best minded rAma with sIthA, being fully engaged in her, living in her heart always, spent many seasons, enjoyed with her) and how he united with AzhwAr to be seen as “Ekathathvam” (single entity); he also thought that the pleasure acquired by him cannot be fully consumed by himself alone and sought out others as companion to share the joy, unlike worldly pleasures which are enjoyed in privacy; as there was none in this material world to share such spiritual experience, AzhwAr prays “when will I go to paramapadham and unite with the assembly of nithyasUris who are well fixated on this experience?” in thiruvAimozhi 2.3 “Unil vAzh“; mAmunigaL mercifully explains this starting with “UnamaRavE vandhu“. Oh heart! You live along with the devotees of AzhwAr who desired to join the assembly of devotees in paramapadham with the desire of having favourable companions to enjoy the sweetness of the union with sarvESavaran who came without any shortcoming and united with AzhwAr intimately. vAnil adiyAr kuzhAm kUda Asai uRRa mARan adiyArudan nenjE Adu – AzhwAr who was immersed in the desire to be with the devotees in paramapadham, who are well experienced in bhagavath vishayam, unlike as said in mudhal thiruvandhAdhi thaniyan “vaiyaththu adiyavar” (devotees in this world); unite and live with the SrIvaishNavas of this world, who are devotees of such AzhwAr. Alternative explanation – become a part of that group of devotees and enjoy. AzhwAr too said “adiyIrudan kUdi ninRu AduminE” (You all sing this decad agreeing with the meanings in many groups of devotees together and try to dance in joy). This entry was posted in Other, thiruvAimozhi nURRandhAdhi on December 9, 2018 by Sarathy Thothathri. In this pAsuram, mAmunigaL is following AzhwAr’s pAsurams of meditating upon emperumAn‘s parathvam which was thought about incidentally, in his incarnations and instructing the same to others, and is mercifully explaining it. How is that done? emperumAn’s has greatness which not only makes one who is separated from him to suffer, it also makes that person forget about the separation after reuniting again; he also has the greatness of his qualities which are the cause for that greatness; AzhwAr incidentally thought about his supremacy which is the cause for his qualities and mercifully spoke the same as instructions to others along the lines of ithihAsas (epics) and purANas (ancient history) [which speak about his incarnations], in thiruvAimozhi 2.2 “thiNNan vIdu“; mAmunigaL mercifully explains this starting with “thiNNidhA mARan“. Those who approach the divine feet of totally surrendered devotees of AzhwAr, who know how well the firm minded AzhwAr mercifully spoke about sarvESvaran‘s supremacy through his incarnations, will not be overpowered by the relationship with body. thiNNidhA mARan – Previously AzhwAr said in thiruvAimozhi 2.1.10 “mUvAmudhalvA ini emmaich chOrElE” (Oh ever youthful cause of all! Now onwards, please don’t fail [leave] me ever); emperumAn manifested his supremacy rooted upon his being the cause for everything as said in thiruvAimozhi 2.1.11 “sOrAdha epporutkum AdhiyAm sOdhi” (paramjyOthi (supreme light), which is the cause for all entities) and pacified AzhwAr; here it is saying “AzhwAr who sustained himself on seeing that”; alternatively, it can be said as “AzhwAr who explained emperumAn’s supremacy to everyone, to make them understand it firmly”. naNNi avadhAraththE nangu uraiththa – Explaining well the supremacy of SrIman nArAyaNa in his incarnations. Unlike in first decad (thiruvAimozhi 1.1) where emperumAn‘s supremacy was explained in paramapadham along the lines of Sruthi (vEdham), AzhwAr mercifully, well explained his supremacy in his easily approachable incarnations, along the lines of ithiAsas and purANas. Alternatively, it is explained as – AzhwAr enjoyed bhagavAn’s supremacy and explained it well in the context of his incarnations. nangu uraiththa vaNNam aRindhu – This is how one can know how AzhwAr explained it well. To know from AzhwAr’s divine words of firmly establishing his supremacy in his incarnations as in “kaNNan kaN alladhu illai Or kaN” (There is no other protection than krishNa’s protection) [1st pAsuram], “gOpAla kOLaRi ERanRi – Ezhulagum IpAvam seydhu aruLAl aLippAr Ar” (Who else can protect all the worlds out of compassion other than krishNa who is the lion amongst those who are born in cowherd clan and the one who offered alms to rudhra to erase the effects of a very big sin?) [2nd pAsuram]. Further, there are other references which support these as in “dhEvan emperumAnkkallAl pUvum pUsanaiyum thagumE” (Does worshiping and attending, offerings such as flowers fit for anyone other than emperumAn?) [4th pAsuram], “thagum kOlath thAmaraik kaNNan emmAn migum sOthi mEl aRivAr yavarE” (Are there any vaidhikas who know some one greater in radiance than emperumAn who has lotus like beautiful eyes) [5th pAsuram], and starting with “kaLvA” ending with “puLLUrdhi kazhal paNindhEththuvar” (rudhra who rides white bull, four-headed brahmA, indhra and the residents of heaven would offer obeisances to the divine feet of emperumAn, the rider of gaurda and offer him prayers saying “Oh mischievous lord (who hides your dominance in the name of being in an incarnation) who created us and all worlds through your will!”) [10th pAsuram]. While explaining these, AzhwAr mercifully followed the references from mahAbhAratham sabhA parvam 38.23 “krishNa Eva hi lOkAnAm uthpaththirapichAbyaya:” (krishNa is the cause for all worlds), mahAbhAratham AraNya parvam 189.52 “sa Esha pruthu dhIrgAkshasa sambandhI thE janArdhana:“, mahAbhAratham sabhA parvam 39.4 “archyam archithum ichchAma: sarvE sammanthum arhatha” (We wish to worship this supreme soul who possesses all wealth, who is the supreme master, the father, the preceptor, and the one who is fit to be worshipped. All of you should agree to this), “pAdhEna kamalAbhEna brahma rudhrArArchithEna” (his divine feet worshipped with lotus flowers by brahmA, rudhra); also, following the pramANams such as SrI rAmAyaNam sundhara kANdam 35.8 “rAma: kamalapathrAksha: sarva sathva manOhara:” (SrI rAma who has eyes like lotus petals; he is so handsome to be attractive to everyone), SrI rAmAyaNam uththara kANdam 82.9 “pAvanas sarvalOkAnam thvamEva raghunandhana” (agasthya muni says – oh raghunandhana [SrI rAma]! you are the one who purifies all the worlds), AzhwAr mercifully said “thagum kOlath thAmaraik kaNNan emmAn” (emperumAn who has lotus like beautiful eyes) and “IpAvam seydhu aruLAl aLippAr Ar” (Who else can protect all the worlds out of compassion other than krishNa who is the lion amongst those who are born in cowherd clan and the one who offered alms to rudhra to erase the effects of a very big sin?) [2nd pAsuram]. avar adikkE Angu avarpAl uRRArai mElidAdhu Un – Those who became exclusively devoted to their (the previously mentioned devotees’) divine feet, and there itself, approaching them (the previously mentioned devotees) as close confidantes, will not be overpowered by the body which is dirty being made of flesh, blood etc. This means, thatthey will not be overpowered by their bodily connections. This entry was posted in Other, thiruvAimozhi nURRandhAdhi on December 8, 2018 by Sarathy Thothathri. Even in the SrIvishNu purANam, in the context of explaining the word ‘bhagavath’, it begins by saying “this word is attributed to the one who is ever-pure, and possessed with unlimited wealth”, and further proceeds to attribute all auspiciousness to Him. The vaishNava dharma speaks thus: “Even if all the sages get together, it would be impossible for them to sing the glories of bhagavAn, who is possessed with such innumerable auspicious qualities”. Similarly, there are many more examples from SrI rAmAyaNam and mahAbhAratham as well. If someone argues that the Supreme brahman Himself is affected by a limiting adjunct (upAdhi), and hence bound in this worldly existence, then the verses in this chapter that talked about the purity and auspiciousness of brahman (pavithram mangalam param) would become meaningless, since verily the brahman Himself is attributed with unlimited blemishes. It is said that there is no need to dissect a name into its constituent words to understand the meanings of it. Even if one finds a reason for such dissection, it is not prescribed because the names are really not intended for it. This is because, every name of the Lord has its own meaning on the whole, and that name itself becomes a source of knowledge to know about bhagavan. None of the names have any opposition by anyone. Also, as said in the statements “those names derived out of His qualities…”, and “since you all know His greatness, chant His name…” it can be comprehended that the various names of the Lord have the only intention of telling us about His divine qualities. transforming into a mantra in itself, as can be seen in the famous twelve-syllable, eight-syllable, six-syllable and other such mantras in the bhagavat-shastras. Each of such names can independently be used for fulfilling all kinds of desires by a seeker. This is also shown by the scriptural statement ‘nAmachith vivakthana’ (chant His name) by the usage of singular form for the word ‘name’. Although the divine names of the Lord are capable of conferring infinite fruits upon the chanter just by mere pronunciation, knowing the real meanings of each of such names will only help the chanter realize His unlimited auspicious qualities, and his mind is soothed and purified instantly. That is why it is said in the chapter that explains the divine names in the SAnthi parva of mahAbharatham thus: “vyAsa glorified madhusUdhana by chanting His various names along with his disciples. Oh holy one! Please explain the meanings of those divine names to me. Hearing with all attention about the Lord of even the four faced brahmA; I shall be purified from all sins and blemishes, just as the autumn moon is free of all blemishes. We can also learn about the various usages of these divine names of the Lord along with their characteristics from the various chapters such as in udhyOga parva, mOksha dharma, vaishNava dharma, nAma-nirvachana adhyAya etc, as also in the various manthra kalpas (prescription of manthras) in the vEdhic scriptures. Thus ends the introductory chapter (upOdhghAtha prakaraNam) in SrI bhagavadh-guNa-dharpaNa, which is an explanation of Sri vishNu sahasranAmam by the scion of SrI haritha clan, the son of SrIvathsAnga miSra (kUraththAzhwAn) – SrI ranganAtha by name, also called SrI parASara bhatta, who wrote this glorious commentary at the behest of SrI rangarAja (emperumAn himself). The upOdhghAtha prakaraNam ends here. This entry was posted in Other on December 8, 2018 by janani. In this pAsuram, mAmunigaL is following AzhwAr’s pAsurams of considering all entities as equally suffering as himself and is mercifully explaining it. How is that done? 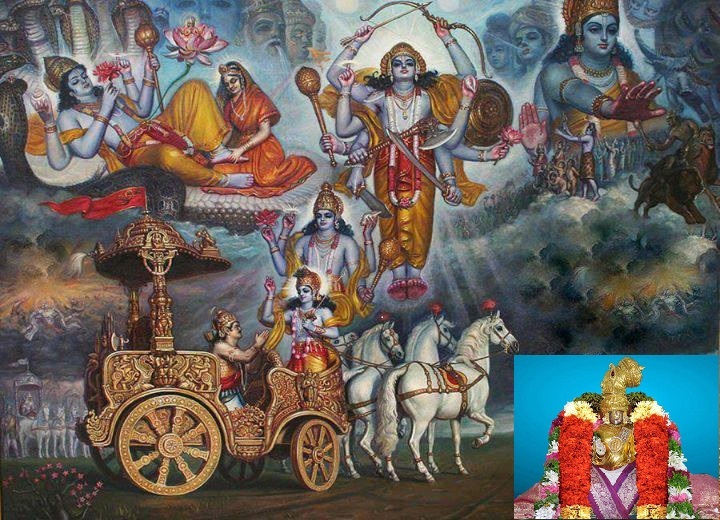 AzhwAr greatly desired for emperumAn as in thiruvAimozhi 1.3.10 “peru nilam kadandha nalladip pOdhu ayarppilan alaRRuvan thazhuvuvan vaNanguvan” (emperumAn has a blackish hue which resembles dark clouds, casually measured the earth with his beautiful lotus feet. I will be firmly engaged with his lotus feet, not forgetting him (meditating upon him constantly), blabbering his glories with my mouth, embrace him with great love and offer obeisances bowing down my head – thus engaging all my 3 faculties of senses (mind, speech and body) in his service), but could not enjoy emperumAn as desired; due to the shadguNa sAmyam (equivalence in six aspects between jIvAthmAs and SrI mahAlakshmi), AzhwAr lost his own state, assumed the state of a pirAtti (consort of emperumAn) and was able to send a messenger in thiruvAimozhi 1.4 “anjiRaiya mada nArAy“; but here, as said in thiruvAimozhi 1.10.9 “nambiyaith then kuRungudi ninRa” etc, AzhwAr desired to enjoy archAvathAra emperumAn who has unlimited supremacy, simplicity and beauty, who is present in thirukkuRungudi so that even those who are subsequent to bhagavAn‘s avathArams (incarnations), can reach out to him; but here too, AzhwAr could not enjoy emperumAn and hence becomes bewildered; he then considers worldly entities such as crane, ibis, ocean, northerly wind, sky, moon, darkness, salt pans, lamp etc are also suffering in separation from bhagavAn like himself, and speaks with grief on behalf of them too, in thiruvAimozhi 2.1 “vAyum thiRai ugaLum“; mAmunigaL mercifully explains this starting with “vAyum thirumAl“. 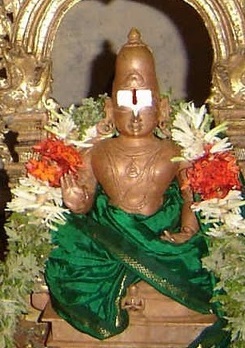 thiNindhu nOkkum – firmly bless with his merciful eyes. As the SrIya:pathi who approaches his devotees, was hiding, AzhwAr‘s sorrow increased and he reached a state of uncontrolled weeping; he embraced those which cannot analyse his sorrow and cried; such AzhwAr firmly blesses the devotees with his merciful eyes. vAyum thirumAl maRaiya niRka – Sriya:pathi who has the nature of approaching his devotees to be enjoyed by them, separated and hid himself from AzhwAr, to control the enjoyment. mAmunigaL is repeating (thirumAl) what AzhwAr said in thiruvAimozhi 1.10.4 “maindhanai malarAL maNavALanai” (the eternally youthful husband of srI mahAlakshmi); it can also be considered to be repeating what is said in “nIyum thirumAlAl” (was your heart also stolen by SrIman nArAyaNa) [pAsuram 1]. As said in thiruvAimozhi 1.10.11 “maNiyai vAnavar kaNNanaith thannadhOr aNiyai” (bhagavAn who has a form which resembles radiant precious gem, who is the controller of nithyasUris, and who is decorated naturally having none to compare against him), due to emperumAn who is having supremacy, simplicity and beauty, separating. ARRamai pOy vinji mikka pulambudhalAy – As said in “ArAdha kAdhal” (never-satiating love) [pAsuram 11], the suffering in separation became too much to handle, and as said in SrI rAmAyaNam ayOdhyA kANdam 102.4 “sIthE mruthasthE svasura: pithrA hInOsi lakshmaNa” (Oh sIthA! your father-in-law passed away; Oh lakshmaNa! you have lost your father), lamenting repeatedly saying “emmE pOl nIyum” (you too are suffering like me). Aya aRiyAdhavaRROdu aNaindhu azhudha mARan – AzhwAr who cried embracing the achEthana (insentient) entities which cannot analyse his sorrows, considering them to be equal partners in his suffering saying “ARRAmai solli azhuvOmai” (crying and lamenting about the helpless state) [7th pAsuram]. azhagiya maNavALap perumAL nAyanAr too said in AchArya hrudhayam “kARRum kazhiyum katti azha” (AzhwAr cried along with wind and salt pan). seRivArai nOkkum thiNindhu – AzhwAr will firmly bless those who confidentially surrender without any expectation. He will bless them so that they will be blissful by uniting with emperumAn unlike himself who had to embrace achEthana entities and cry. This entry was posted in Other, thiruvAimozhi nURRandhAdhi on December 7, 2018 by Sarathy Thothathri. In this pAsuram, mAmunigaL is following AzhwAr’s pAsurams of feeling satisfied after seeing no specific reason and thinking “emperumAn‘s uniting with all limbs is nirhEthuka (causeless)” and is mercifully explaining it. How is that done? Is anything that can be done by the AthmA to acquire this great benefit of joyful, complete union by emperumAn? As emperumAn is the controller of all aspects of AthmA such as budhdhi[intelligence] etc and emperumAn is of the nature of accepting the AthmA without any reason by instilling adhvEsham (lack of hatred), parigaNanA (counting emperumAn’s presence) and finally paramabhakthi (inability to sustain without being with emperumAn); thinking about emperumAn’s causeless favour, AzhwAr becomes satisfied in thiruvAimozhi 1.10 “porumAL nIL padai“; mAmunigaL mercifully explains this starting with “porum Azhi sangudaiyOn“. vAzhththiduga – let it perform mangaLASAsanam. AzhwAr firmly visualised and mercifully spoke the way emperumAn who is having SrI SudharSana chakra and SrI pAnchajanya in his hand, incarnates on this earth without any reason and gives himself; let my head bow down at such AzhwAr’s divine feet; let my mouth perform mangaLASAsanam for him. porum Azhi sangudaiyOn pUdhalaththE vandhu – sarvESvaran who has divine weapons such as chakra (disc), Sanka (conch) etc which engage in battle with enemies, became visible to the eyes of the residents of this material world which has enmity towards emperumAn. mAmunigaL explains this based on the pAsuram starting with “porumA nIL padai” (the weapons which wage a battle) and ending with “karu mANikkam en kaNNuLadhAgum” (the dark gem like emperumAn is inside my eyes) [first pAsuram]. tharum ARu Edhu aRath thannai – the way he presents himself without any reason. Or Edhu aRath thannaith tharum ARu – The way he presents without any reason, himself who is the goal. thiramAgap pArththurai sey mARan – That is, AzhwAr who visualised how emperumAn presents himself for both bhakthi (devotion) and parigaNanA (mere counting of his presence) as said in “kaNNuLLE niRkum kAdhanmaiyAl thozhil eNNilum varum” (emperumAn is present for those who are devoted to him and serve him and to those who merely accept his presence) [2nd pAsuram], and further how he manifests himself out of nirhEthuka krupA (causeless mercy) as said in “Or eN thAnum inRiyE vandhiyalum ARu – kaNdAyE” (Did you see how the results are fructified for us even without contemplating on any efforts?) [5th pAsuram] as in SrI rAmAyaNam bAla kANdam 1.29 “sahitha:” (together with brothers) and in SrI rAmAyaNam bAla kANdam 1.58 “sangatha:” (united with hanuman), and mercifully explained for the benefit of the ignorant persons. padham paNiga en senni vAzhththiduga ennudaiya vAy – In this manner, AzhwAr became satisfied in emperumAn‘s nirhEthuka vaibhavam (causeless glories) and mercifully revealed these aspects; let my head worship such AzhwAr’s divine feet as said in sthOthra rathnam 5 “mUrdhnA praNamAmi” (bow my head); let my mouth perform mangaLASAsanam him as said in AzhwAr’s vAzhi thirunAmam “thirukkurugaip perumAL than thiruththALgaL vAzhiyE” (let the divine feet of AzhwAr who is the lord of thirukkurugUr live long). In this manner, mAmunigaL mercifully revealed how he became immersed in AzhwAr’s divine feet due to overwhelming gratitude. This entry was posted in Other, thiruvAimozhi nURRandhAdhi on December 6, 2018 by Sarathy Thothathri.